Our range of products include phytase 5000 iu granules, tiamulin hydrogen fumarate 10 % granules, tylosin phosphate 10 % granules, bacitracin methylene disalicylate (bmd 10% ) granules, vitamin premix for layers and chlortetracycline 15% granular. Active Ingredient This product contains Rainphos enzyme with carrier. Rainphos is a thermostable phytase 5000 fyt/ gm which help to release phosphorus present in phytate form in the plants. Rainphos helps to improve the phosphorus level in the birds. 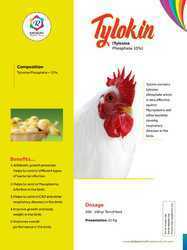 100gm-200gm of tiamulin 10% per ton of feed or as per the advice of the veterinarian/consultant. Birds should not receive products containing monensin,narasin or salinomycin during or for at least seven days before or after treatment with tiamulin 10% severe growth depression or death may result. 200 ~ 500gm of tiamulin 10% per ton of feed on regular basis through out the laying cycle. 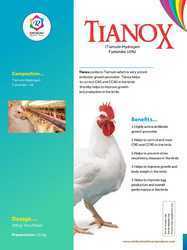 For poultry and pigs, it is especially effective for treatment of mycoplasmosis and chronic respiratory diseases. For turkeys – for treatment of Infectious Synovitis and Sinusitis. It is effective also for treatment of Ileitis, Dysentery and Necrotic Enteritis in swine. It is successfully applied as a preventive measure in stress conditions as vaccinations, transportation and others. It is compatible with Tetracycline, Sulphonamide, Erythromycin and Spectinomycin. (in egg-producing fowls). 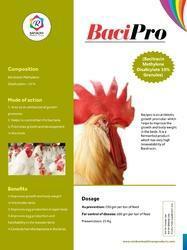 Bacipro is an antibiotic growth promoter which helps to improve the growth and body weight in the birds. It is a fermented product which has very high bioavailability of Bacitracin. Leveraging on the vast industry experience, we have been able to offer the clients Multivitamin Premix. Monitored by the qualified professionals, the processing of the product is carried out in compliance with the set industry standards and quality norms. To ensure their effectiveness of the offered granules, these are tested on different parameters by the quality controllers of our firm. 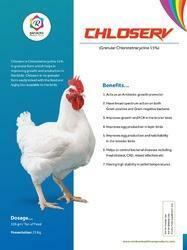 Chloserv is Chlorotetracycline 15% in granular form which helps in improving growth and production in the birds. Chloserv in its granular form easily mixed with the feed and highly bio-available to the birds. Usage Helps to eliminate the toxic effect and harmful toxins from feed and enhance the food supplements. Mycotoxins are one of the most important problems faced by the poultry industry. Mycotoxins are synthesized by the fungus when the raw materials used in feed have high moisture content. There are various mycotoxins including mycotoxins including Aflatoxin, Zearlenone, Ochratoxin, Vomitoxin, Fumonisin etc. which affect various parts of the body. These mycotoxins damage the vital organs including liver, kidney and ovary. Thereby resulted in poor FCR, poor Growth & Development and poor Production in the birds. 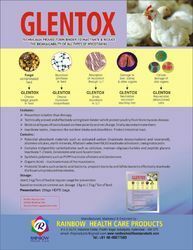 Glentox is a specially designed toxin binder containing Hydrated Sodium Calcium Aluminosilicate (HSCAS), Buffered Organic acids, Activated Charcoal & Herbal extract. 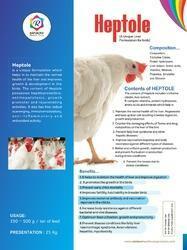 Heptole is a unique formulation which helps in to maintain the normal health of the liver and improves growth & development in the birds. The content of Heptole possesses hepatoprotective, antihepatotoxic, growth promoter and rejuvenating activities. It also has free radical scavenging, immunomodulatory, anti-inflammatory and antioxidant activity. 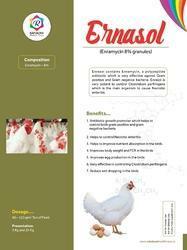 ENRASOL is a polypeptide antibiotic obtained by the incubation of Streptomyces fungicidicus. For physicochemical properties, ENRASOL technical occurs as a gray-brown to brown Micro Granules or particles and slightly has a characteristic odor. It is freely soluble in dilute hydrochloric acid and in dimethylformamide, slightly soluble in water and in methanol, and very slightly soluble in acetone, in ethanol, in benzene. Improves flock intestinal & Gut health, resulting in better FCR and growth Rate . No side effects; cost effective; consistent performance. Improves feed efficiency and growth. Difficult to build farm Resistance. It has no direct action on genetic codification of the bacteria but it only interrupts one of the phases of the normal metabolism of membrane formation. Enhances growth and FCR at very low inclusion levels. 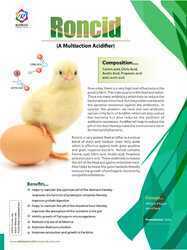 Strong antibacterial properties primarily against Gram-positive bacteria such as Closridium perfringens, which causes necrotic enteritis and retarded growth in Chickens . 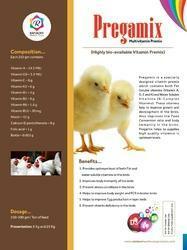 Broilers : Starter and pre-starter feed: 63 to 125g/ton of feed . Finisher: 38 to 125g/ton of feed . Layers & Breeders : 63 to 125g/ton of feed . Nephrosafe Kidney Refresher is a very effective kidney tonic which helps to maintain the health of kidney. 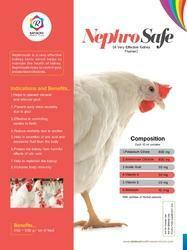 Nephrosafe helps to control gout and ascites in the birds. Contains a Blend of Organic Acids & their salts,buffering agents,Organic acid Secreting Pro Biotic Strains of Normal Flora. Buffering agents maintain the acidic PH for long time. 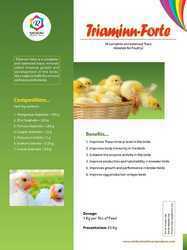 Triaminn forte is a complete and balanced trace minerals which improve growth and development in the birds. Also helps to fulfill the mineral deficiency in the birds. 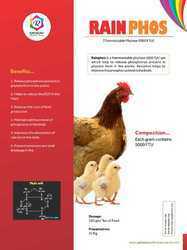 Looking for Poultry Feed Supplements ?